Those of us who live in areas with snowy winters have all done it. After a snow storm, perhaps in a rush, you clean only the windows, get in and drive off. This post illustrates (!) the hazards of not clearing the snow from the whole car. This is the tale of how I lost my windshield to some snow I left on top of my car. Heed these words, it could happen to you. 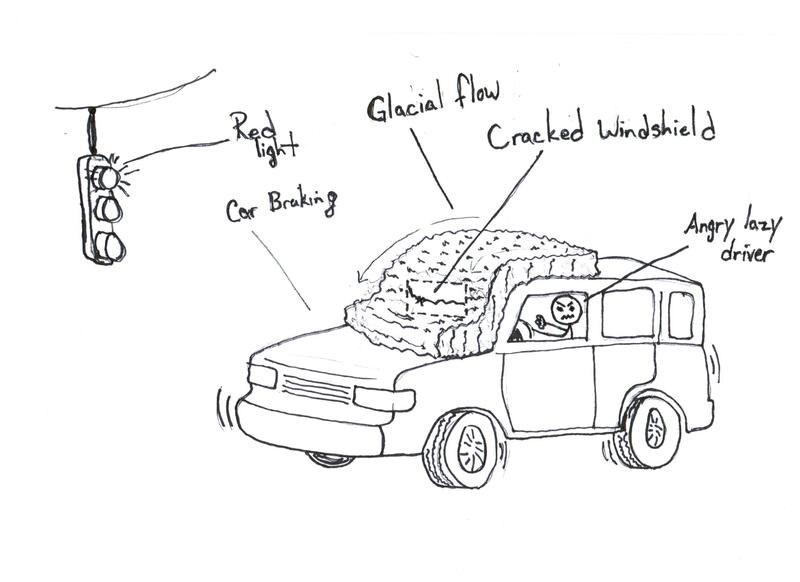 I will confess that my windshield was not in perfect condition, as it had small rock chip on the passenger side (as seen in Figure 1). The chip had been there for some time and had never gotten bigger. However, on one fateful night last winter, I came out to the car, brushed the snow off the windows, and went out driving. The defrost was on, I was toasty and happy inside my comfortable, heated chariot. As I motored on, I came to an intersection as the light was turning yellow, then red. Deciding that I should not tempt Johnny Law, I applied firm brakes and the car slowed. 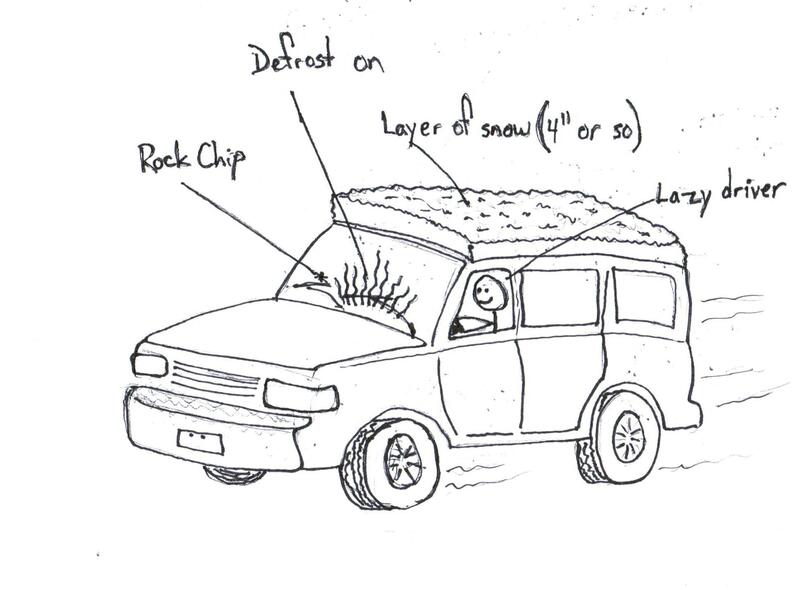 Unfortunately, the snow on the roof did not slow at the same rate as the car, and it cascaded down off the roof and onto the windshield, as seen in Figure 2. The defrost had been on, and the shock of the sudden temperature change was more than the windshield could bear. It cracked with a loud pop, instantly running lengthwise all the way across the windshield. Aside from the obvious safety issue of not being able to see through the windshield, this caused me to incur the expense of a brand new replacement windshield. Need That Car implores of you, please be sure to clear all the snow from your car before driving. It could cost you money. Money, I say. You could also suddenly lose the ability to see what is in front of your car, which could cause accidents, trauma, and airbag deployment. This entry was posted in Helpful Hints, Items of Interest (Not for sale). Bookmark the permalink. Re: Glacial flow – the terminal moraine will seriously mess up your aerodynamics as well. Love the illustrations! And I have to add that lazy drivers who have a big layer of snow on the roof are a major pain for other motorists on the freeway – when they enter an onramp and merge into traffic, 9 times out of 10, that glacial deposit comes flying off at about 65 mph and lands straight on my hood. Also, 77% of all statistics are made up on the spot.